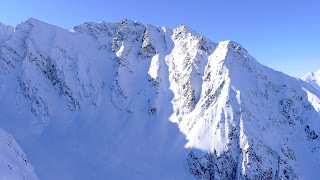 Mammut Avalanche Safety: Thanks! 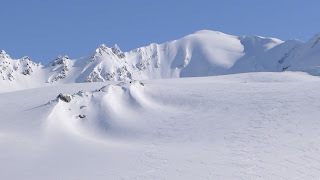 From Valdez Heli-Ski Guides. The 2013 season at Valdez Heli-Ski Guides is in full swing and we would like to thank Mammut North America for their continued partnership and support. Operating out of the Tsaina Lodge on Thompson Pass, VHSG is in our 20th season. Our guide staff has over 100 years of cumulative experience ski-guiding in this very mountain range--our guides, on average, have worked for us for 7-15 consecutive years. We specialize in big-mountain ski guiding but also enjoy and make use of the many miles of rolling glacial cruisers. Our Terrain Progression Program is intended to introduce big-mountain skiing to competent, life-long skiers who are looking for keys to these castles. Triple Jeopardy, on Billy Mitchell, is an VHSG test-piece. after progressing through VHSG's Terrain Progression Program. at 45 degrees, it was once one of our "easy runs." There are, in fact, many mellow cruisers in the Chugach Mountains. 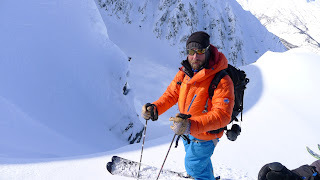 VHSG is a Mammut North America partner. Clients are issued Mammut Element beacons and Rocker 18 RAS packs. Guide uniforms include Pulse beacons, Stoney Pants, Broad Peak Down Jackets, and Masao Jackets. Eigerjoch down jacket and Stoney Pants. Eigerjoch down jacket and Stoney Pants." And his hardware-store work gloves! Can no outdoor company improve on Kinko gloves?